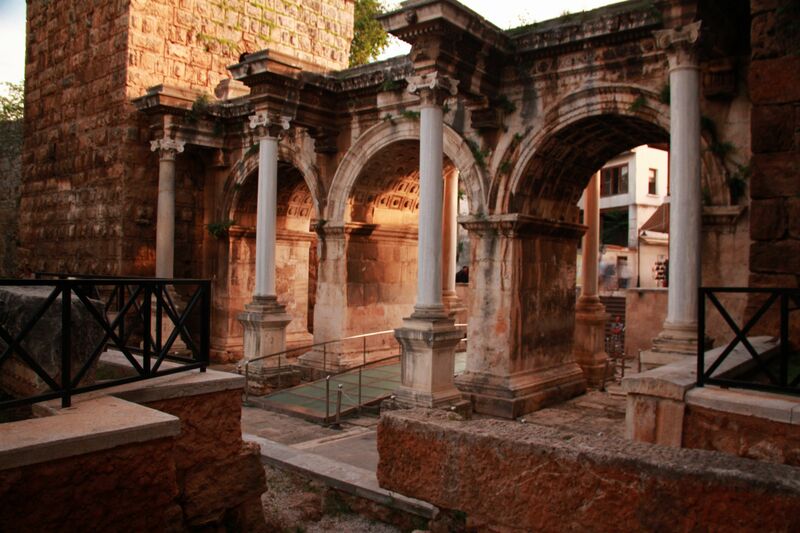 Hadrian’s Gate, nearly the only thing to see in Antalya. At breakfast in Antalya I pile my plate with fresh French bread, olives, feta, and slices of cucumber and tomato. I go back twice more, balancing the ratios and refilling my cup of cai. I’m nervous about flying to Eastern Turkey and the rumors of insecurity and violence that I’ve heard, and the Nervousness Lottery awards me the ability to eat massive quantities this time. Around me amiable Midwesterners sit and chat amiably. An amiable fellow from Memphis tells a Turkish man about Elvis and the vigil they have every year on his birthday. The Turkish man listens with a perplexed look on his face, but the Memphisian is just so…amiable. As I refill my plate for the third time, he asks me if I’m headed home. I tell him no, I’m heading to Diyarbakir, in Eastern Turkey. He has nothing to say to that. An uncle of the hotel-owner family drives me to the airport. He drifts around the road, occasionally settling into a turn lane for a split second before getting bored with it, passing on the outside then cutting through the red-light intersection and away we go. When the plane approaches Istanbul the city is marinating in fog. I assume it’s weather, and it has to be, right? The tear gas being sprayed by riot police down in Taksim Square against a few desultory protesters can’t account for all that haze, can it? We land, people clap then jump up to get stuff out of the overhead bins while we’re still moving down the runway. An irritated stewardess announces“Attention passengers, we have not reached the gate, please remain in your seat and do not take objects from the overhead compartment.” She has to repeat it. I am the only tourist in the boarding area for my flight east. Men’s dark eyebrows furrow while they stare at me, and women in headscarves do not even glance my way. Someone has given the children balloons, which bob above the crowd to an undercurrent of screaming as an older brother takes one away, one pops, or assorted other tragedies of balloonery. There is a woman in my seat on the next plane, but I am pretty sure I’m not allowed to speak to her directly. Whatever, I take a seat a row ahead. A little while later a stewardess says something to me in Turkish, I hand her my ticket stub, there is a discussion, the woman behind refusing the move, then the stewardess puts her hands up, “ok, ok” and we all stay where we are. I am the only tourist on the plane, the refreshment cart passes right by without a word to me. It’s a budget airline anyway, which means it operates like an American or European one, so no free food. On my three hour Turkish Airlines flight to Istanbul we got a full meal and drinks. Western miserly capitalism is losing the customer comfort battle in the airline industry. Like other budget airlines, we make an unaccountable number of turns, and just as with Ryanair, I wonder if Pegasus is saving money on navigation equipment as well. 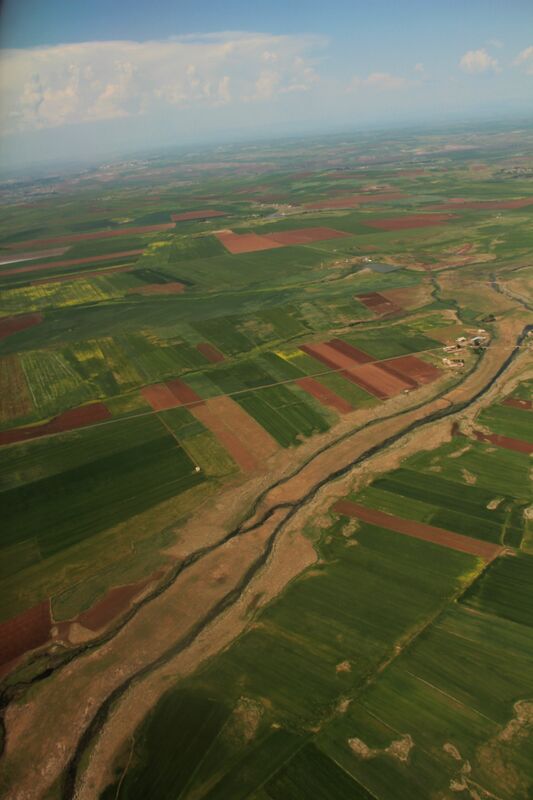 Diyarbakir is surprisingly green from the air, and a great river winds away below. I realize it’s the legendary Tigris, and I am impressed. When we land in the cradle of civilization, I am feeling nervous. I don’t really want to get off the plane, things are simple here. The military shares the airport, and there is a sign for what I assume is a military runway saying “MIL F →”. Alone in the grass beside the runway leans a mannequin with blond hair and blue eyes. When I got on the plane the flight attendants greeted us in Turkish, but as we get off they use Kurdish. Diyarbakir is predominantly Kurdish, and one website advised that if I buy the bandana with the colors of the Turkish independence guerrilla group, I will have a lot of friends. One of the buckles on my backpack is broken when it comes off the belt, but luckily it’s not one of the essential ones; that would be catastrophic. My gear is wearing these days, with a prong on each my shoulder bag buckles also broken off, toothbrush and soap cases cracked, and clothes needing regular need & thread maintenance (to be fair, the regular maintenance is mostly the result of my poor sewing). Taxi drivers are customarily satanists, so I look for a bus and find seven. The first is full of women so I move to the second, full of men. I don’t know the word for “downtown.” The driver asks me a question in Kurdish. “Uh…downtown?” I say. I don’t even know which direction to gesture. He shakes his head in confusion. “Ah! No, no!” He gestures me towards another bus. His name is Ferit and he is my best friend. He tells me they like Americans here, and are thankful to George Bush for freeing them. I say I’m glad, and decline to tell him my views on Dubya, though the more I learn about the Kurds, the more I think that was one thing that he got seriously right. Saddam really did need to go. I just wish I believed we did it for the right reasons and in a better way. Out my hotel window just now. Diyarbakir looks okay out the bus window. Like the outskirts of Belgrade, Guatemala City, or Casablanca. Any place you won’t see on the Travel Channel, but where people are going about their lives on crowded streets while laundry hangs to dry on balcony railings next to a profusion of satellite dishes on the profusion of seven-storey housing blocks. Ferit gets off before me, and I miss him immediately. 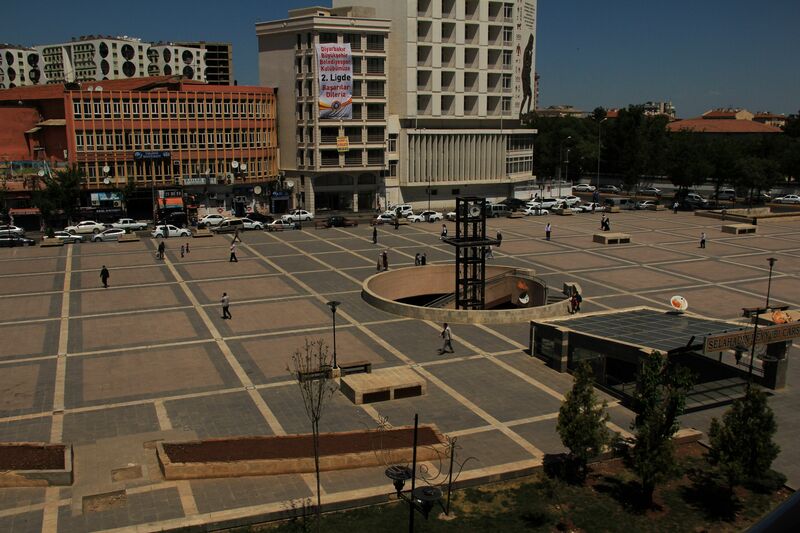 He has told me I must go to Mardin, and was glad to hear that it was the real reason I came. Before he goes, he tells the driver to let me know when we are near one of the three hotels I researched before coming. A few minutes later the driver gestures me off, and I am walking across an open square where kids are playing soccer, men are smoking, and the cart in the corner is ready to squeeze some oranges for me. ← Time to leave the loop. I read your last blog post and meant to leave a message to tell you that I thought you’d cope fine in Diyarbakir and Mardin. Miles and I passed through both Diyarbakir and Mardin briefly in 2008 (a couple of months before we met you in Mostar) and felt perfectly safe there. We also thought that the food in Diyarbakir was awesome! Mmmm… turkish bread… FYI: From memory, from Diyarbakir we caught a bus to Mt Nemrut and then on to Cappadocia – I’d highly recommend visiting both of those places, if you haven’t already 😉 Happy travels! Fran! Nice to hear from you, and thanks for the assurance. I was actually thinking about you guys when I started doubting, and how y’all wandered across Iran. Hmm…maybe I should head that way… I raise a glass of çai and some Diyarbakiri food to you two adventurers and that cute little one you’re raising! It is a very interesting travelogue. I am looking forward to hear more about Diyarbakir and Mardin. Thanks Hanna, I’m glad I’m not the only one who finds these places so interesting! Is that coffee or cai in the photo? Either way it is a gogreous image. 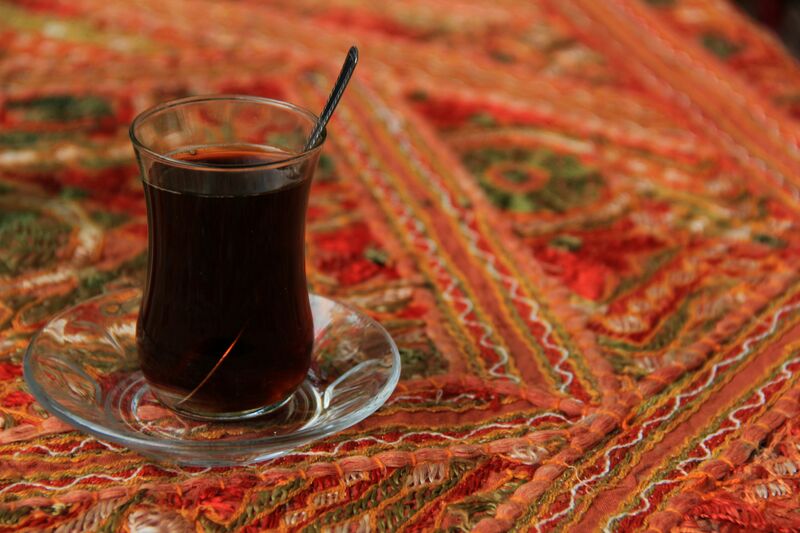 I just found a page on another travel site offering “tea and coffee tips and photos posted by real travelers and Istanbul locals. Who knew!?!? (your picture is by far the loveliest of them though). To make is all the more surreal, there is an ad on that page for Monterey, CA. Say, did you have any backgammon adventures over there? I keep waiting, and they are not coming. I may have to have some of my own over here, Greek style. It was all cai for me the whole time I was in Turkey, which I didn’t really realize until the end. I remember loving Turkish coffee in Montenegro, but it was not to be. Sadly no backgammon adventures. I was invited to play some sort of tile game in Selcuk, but I had not the foggiest of how to play…which would have made it awkward if I’d won. I hereby declare my intentions to drink cai and play a game or two of backgammon with you, some sunny day in the future. Yes please! I should have a vriki (Greek coffee pot) by then! Coffee, new vocabulary, AND excellent conversation? You GET me!